The golden sunlight of a late afternoon fall day filters through the trees, where red and yellow leaves are gradually poking out through the greenery. Children ride their bicycles down side streets and in cul-de-sacs, while families play catch and football in their large yards. Though it sounds like the opening scene of a family film, it’s just another afternoon in the Sevierville neighborhood of Belle Meadows, located off of Ernest McMahan road and Middle Creek road. Wide roads wind through Belle Meadows, with mature trees and well-manicured lawns lay before the moderate to large sized homes. Flowers, bushes and decorative lawn ornaments accent the landscape, with the occasional picket fence giving the neighborhood a picturesque quality. Some driveways are paved with brick, while some cul-de-sacs have stout pink or red brick mailboxes holding sentry at the base of wide driveways. The home architecture is cohesive, giving the neighborhood a community feel, yet each house is unique. Even the street signs add to the neighborhood community feeling, with each street name included the name Lea. Neighbors take a stroll, waving to one another and calling hello. A calming quiet lives in Belle Meadows, providing a peaceful atmosphere. As darkness nears, the charming street lights flicker on. The Victorian design adds to the neighborhood unity. It’s the type of neighborhood you can imagine having summer block parties, with fireworks bursting in a night sky as the scent of grilled hamburgers and hot dogs wafts through the air. Each October, Belle Meadows becomes Trick or Treat central for Sevierville. Hundreds of children, costumed and excited, walk and play as they dart from house to house. Choruses of “Trick or Treat!” in eager voices echo from porch light to porch light. The police set up roadblocks to allow the children to meander even more safely. Adorable faces smile up at their adult companions, parents and grandparents, aunts and uncles, as they jump and bounce in joy over their newly acquired candy. 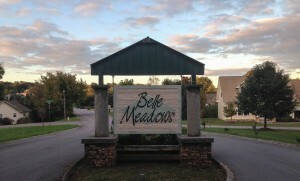 With Belle Meadows terrific Sevierville location, you’re only minutes from shopping and dining. From local restaurants to successful chain restaurants, you’re sure to find something to love between Sevierville, Pigeon Forge and Gatlinburg. The proximity to the Great Smoky Mountains National Park means a day of enjoying nature is never far away. Whatever your style or taste, we’re here for all of your real estate needs. Whether you’re in the market for a distressed cabin, historic home or a place in a community like Belle Meadows, we can help you find what you’re looking for. Are you interested in a home in Belle Meadows? You can find our current listings here. Or, click here for the surrounding area as well. Have you been neighborhood exploring lately? If you’re interested in a particular neighborhood you’d like to see a profile on, let us know in the comments section!